With an altitude of 1,600 metres, a lovely climate throughout the year, rolling hills with tea estates, gushing waterfalls and an unhurried pace of life, it's not difficult to see what lures the visitors to the picturesque hill-station of Munnar, located at the confluence of the Muthirappuzha, Chadavurai and Kundaly rivers and 105 km from Cochin. 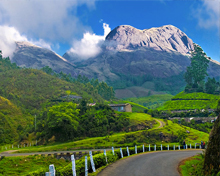 Munnar beckons with an astounding variety of natural beauty and spectacular scenery. Situated at an altitude of 6000 ft in the Idukki district of Kerala, the place holds great appeal for those with an appreciative eye for exquisite beauty - from unending expanse of tea plantations to pristine valleys and the verdant mountains of the Western Ghats; and from national parks and sanctuaries teeming with wildlife, to the beautiful lakes. 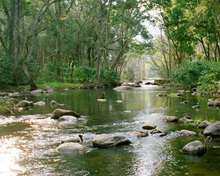 Until the early 1990s, Munnar was untainted by commercial tourist development. However with the declaration of Munnar as a tourist spot in 2000, by the Government of Kerala, this stunning destination has started attracting visitors in hordes. 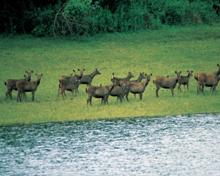 Wildlife in Munnar flourishes in the several national parks and wildlife sanctuaries such as Kurinjimala Sanctuary, Chinnar Wildlife Sanctuary, Eravikulam National Park, Anaimudi Shola National Park and Pampadum Shola National Park. These wildlife sites are renowned for their outstanding variety of game including Nilgiri Thar, Nilgiri Wood-pigeon, Grizzled Giant Squirrel, Elephant, Sambar, Gaur, and Neelakurinji. Tea Museum, CSI Church, Mount Carmel Church, Blossom International Park and Tea Estates are some of the attractions of Munnar. Lakkam, Nyayamakad, Attukal, Chinnakkal, Cheeyappara, Kuthumkal, Valara and Thoovanam are some of the famous waterfalls of Munnar. Mattupetty, Pothamedu, Devikulam, Pallivasal, Attukal, Attukal, Nyayamakad, Chithirapuram, Lock Heart Gapajamala and Eravikulam National Park are nearby attractions of Munnar.